What you eat can have a huge impact on your skin. It's important to eat the right foods in the right quantities to help skin look and perform its best. Fortunately, there are all kinds of super ingredients that will nourish your skin from the inside out. Here are some of the best to include in a skin-friendly diet. The first is healthy fats. You may remember that one habit to avoid for healthy skin is eating too little. That's because if you don't eat enough healthy fats, your skin will look dry and gaunt rather than moisturized and plump. Look for monounsaturated and polyunsaturated fats, especially omega-3 and omega-6 fats. You’ll find them in avocados, fish, nuts, and seeds. The fatty acids in these foods moisturize your skin and provide vitamin E to help fight free radicals. Omega-3s are also a great anti-inflammatory, so they're especially important if you suffer from a condition such as eczema or psoriasis. Second, include sufficient vitamin C — up to 1,000 mg daily or to bowel tolerance. This antioxidant strengthens your immune system, enhances skin radiance, and helps resolve blemishes. Plus, vitamin C produces collagen, which keeps skin looking firm and youthful rather than old and sagging. You’ll find Vitamin C in brightly colored fruits and vegetables. These include blueberries, blackberries, raspberries, strawberries, broccoli, kale, green lettuces, chard, celery and yams. Make sure you take your vitamin C with vitamin E (up to 800 IU daily). 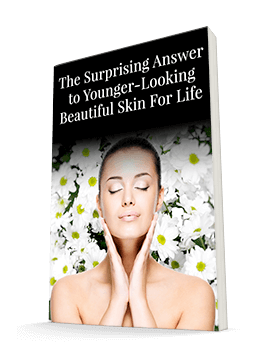 I’ve told you in the past about how these two vitamins work together to protect your skin. Once you've gotten sufficient vitamins C and E, you'll want to make sure you're getting sufficient selenium. Selenium, a trace mineral with antioxidant properties, works with these vitamins to boost your immune system, and has been shown to help minimize sun damage. It's easy to get selenium in your diet – eating just four Brazil nuts will give you 200 mcg – that’s all you need! Or, if you prefer, you can find selenium in fish, eggs, wheat germ, tomatoes, and broccoli. If you're eating nuts and fish, you'll also be getting zinc. Your body needs zinc to keep your oil-producing sebaceous glands functioning properly and to keep your skin soft. You can also find zinc in lean red meat, oysters, black beans, aduki beans (remember to soak your beans before cooking them) and poultry. Of course, you don't (and shouldn't!) live on produce and protein alone to have healthy skin. Carbohydrates have a place as well. Just make sure they're low on the GI scale, such as beans and whole grains, quinoa, brown rice, and oatmeal. These will help you stay full and energized and keep you from reaching for the sugary and salty snacks that wreak havoc on your skin. Whole, unprocessed foods are full of the vitamins and antioxidants we need to have beautiful skin. Who knew you could fill your plate with skin care products?